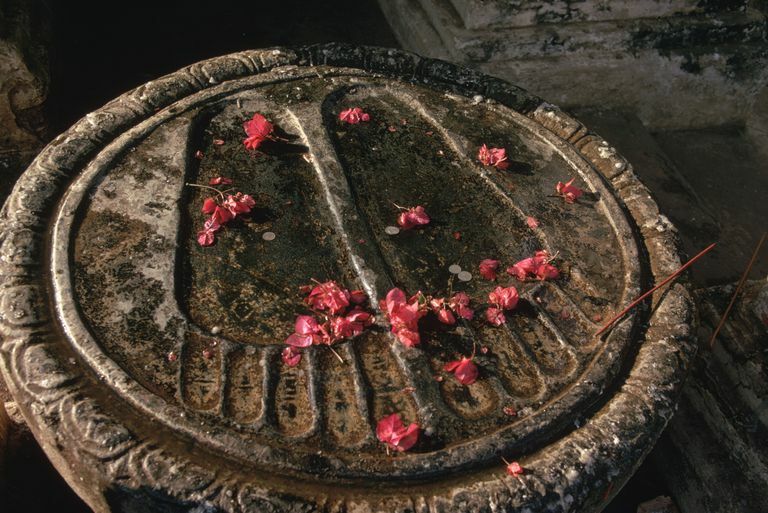 The Buddha's footprints at Bodh Gaya, thought to be where the Buddha realized enlightenment. The historical Buddha, also called Gautama Buddha or Shakyamuni Buddha, was believed to have been about 29 years old when he began his quest for enlightenment. His quest was accomplished about six years later when he was in his mid-30s. The story of the Buddha's enlightenment is not told exactly the same way in all schools of Buddhism. There are, of course, elements of folk history and fable at work here, as the details of Siddhārtha Gautama, a clan prince living roughly between the years of 563 BCE to 483 BCE, are not precisely known. It is certain, however, that this young prince was an actual historical figure, and that the transformation he underwent set in place a spiritual revolution that continues to this day. Raised in a life of privilege and luxury and protected from all knowledge of pain and suffering, young Prince Siddhartha Gautama at the age of 29 is said to have left the family palace to meet his subjects, at which time he was confronted with the reality of human suffering. Having been confronted with the Four Passing Sights, (a sick person, an aged person, a corpse, and a holy man) and greatly troubled by them, the young prince renounced his life, then left his home and family to discover the truth of birth and death and to find peace of mind. He sought out one yoga teacher and then another one, mastering what they taught him and then moving on. Then, with five companions, for five or six years he engaged in rigorous asceticism. He tortured himself, held his breath, and fasted until his ribs stuck out "like a row of spindles" and he could almost feel his spine through his stomach. Yet enlightenment seemed no closer. Then he remembered something. Once as a boy, while sitting under a rose-apple tree on a beautiful day, he had spontaneously experienced great bliss and entered the first dhyana, meaning he was absorbed in a deep meditative state. He realized then that this experience showed him the way to realization. Instead of punishing his body to find release from the confines of the self, he would work with his own nature and practice purity of mental defilements to realize enlightenment. He knew then that he would need physical strength and better health to continue. About this time a young girl came by and offered the emaciated Siddhartha a bowl of milk and rice. When his companions saw him eating solid food they believed he had given up the quest, and they abandoned him. At this point, Siddhartha had realized the path to awakening was a "middle way" between extremes of the self-denial he had been practicing with his group of ascetics and the self-indulgence of the life he had been born into. At Bodh Gaya, in the modern Indian state of Bihar, Siddhartha Gautama sat beneath a sacred fig (Ficus religiosa) and began to meditate. According to some traditions, he realized enlightenment in one night. Others say three days and three nights; while others say 45 days. When his mind was purified by concentration, it is said he acquired the Three Knowledges. The first knowledge was that of his past lives and the past lives of all beings. The second knowledge was of the laws of karma. The third knowledge was that he was free of all obstacles and released from attachments. The demon Mara is portrayed in many different ways in early Buddhist texts. Sometimes he is the lord of death; sometimes he is the personification of sensual temptation; sometimes he is a kind of trickster god. His exact origins are uncertain. Buddhist legends say that Mara wished to stop Siddhartha's quest for enlightenment, so he brought his most beautiful daughters to Bodh Gaya to seduce him. But Siddhartha did not move. Then Mara sent armies of demons to attack him. Siddhartha sat still, and untouched. Then, Mara claimed that the seat of enlightenment rightfully belonged to him and not to a mortal. Mara's demon soldiers cried out together, "I am his witness!" Mara challenged Siddhartha---These soldiers speak for me. Who will speak for you? Then Siddhartha reached out his right hand to touch the earth, and the earth itself spoke: "I bear you witness!" Mara disappeared. To this day, the Buddha often is portrayed in this "earth witness" posture, with his left hand, palm upright, in his lap, and his right hand touching the earth. And as the morning star rose in the sky, Siddhartha Gautama realized enlightenment and became a Buddha. After his awakening, the Buddha remained at Bodh Gaya for a time and considered what to do next. He knew that his great realization was so far outside normal human understanding that no one would believe or understand him if he explained it. Indeed, one legend says that he tried to explain what he had realized to a wandering mendicant, but the holy man laughed at him and walked away. Eventually, he formulated the Four Noble Truths and the Eightfold Path, so that people could find the way to enlightenment for himself. Then he left Bodh Gaya and went forth to teach. Do You Know the Legend of the Birth of the Buddha? Who Was Rahula in Buddhism? What Is the Buddha of a Future Age? How Did the Buddha Enter Nirvana? Who Were Some of the Most Important Disciples of the Buddha?